There’s been a lot of hype around Bloodborne, an insanely difficult RPG from the creators of Dark Souls, this week. Released on Tuesday, the game has been praised to the sun for bucking the trend of games getting easier. We remember the days when more or less every game was hard, though – including quite a few games that had no right to be. Here are 7 of our favourite surprisingly difficult retro games! Toy Story 2 is one of the most popular animated films of all time, so you’d assume that Toy Story 2: Buzz Lightyear to the Rescue would be equally accessible and fun for all ages, right? Erm…not quite; Buzz Lightyear to the Rescue is harder than Ross Kemp holding a housebrick encased in titanium. Highlights include a construction site level where you live in permanent fear of being squished by a jackhammer and a series of races with RC Car, who is less ‘cuddly remote controlled toy’ and more ‘merciless racing king who loves nothing more than leaving you eating his dust’. Any kid that managed to complete this game deserves massive amounts of respect and possibly a medal too. Believe it or not, Toy Story 2 isn’t actually the hardest Disney game ever made. That honour belongs to The Lion King, a game so unforgiving and stress-inducing that it makes Bloodborne look like a relaxing game of Pong. Due to the restrictions of technology at the time and (presumably) the developer’s wish to make young children cry uncontrollably, The Lion King is nigh-on impossible. The lowlight is a section where you have to ride on the back of an ostrich, which is capable of sparking off the kind of tantrum usually reserved for when your mum wouldn’t buy you a Kinder Surprise in the supermarket. Oh, and that’s just level 2. If you did manage to get past level 2 (well done you) then the game only gets harder. And guess what? You can’t save! If you die, you’re back to the very beginning, which means you get to do flipping LEVEL 2 ALL OVER AGAIN! Aww, look at that. It’s a little monkey in a hamster ball and he’s rolling around with a big cheeky smile on his face! Well, good for him because after 5 minutes playing Super Monkey Ball on Expert mode, he’s the only one who’ll be smiling. The game gives you 60 seconds to navigate through a series of increasingly challenging levels, although we’re only speculating on that because we never managed to make it past the first ridiculously challenging level. Curse you, happy monkey! Guitar Hero was a brilliant way to pretend you were a shredding god without having to waste all those precious hours practising. Nothing was cooler than striding around your bedroom pretending to be Slash, if Slash played a guitar with no strings and colourful plastic buttons. Unfortunately, as you worked through the difficulty levels, Guitar Hero actually got harder than playing the real guitar. In the time it took us to finally complete Through The Fire and Flames on Expert, we probably could have formed our own band and conquered the world. If there’s one lesson to take from this post, it’s that games involving cute monkeys are insanely difficult. On the face of it, Diddy Kong Racing was a cutesy racer that the whole family could enjoy. But then it soon became clear; this is the kind of game only people with the patience of a Buddhist monk waiting in a 4 hour queue while being poked with a stick could truly enjoy. Honestly, we hate the Wizpig more than we’ve ever hated any other videogame character. Just let us win will ya?! People tend to forget that the first Crash Bandicoot was teeth-clenchingly difficult (perhaps because the sequels were a lot easier). 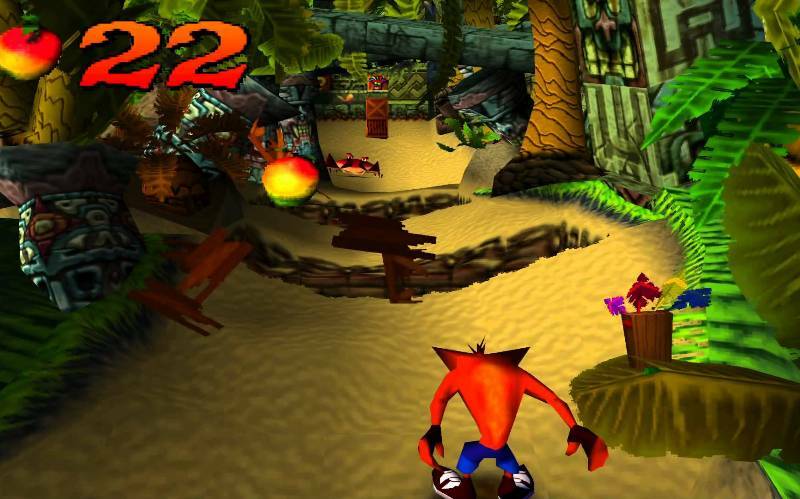 One hit would kill you, there were no save points if you didn’t complete the end-of-level bonus section and levels like Slippery Climb and Hog Wild were responsible for most of our childhood nightmares. It’s still a great game. Just remember to keep a couple of stress balls handy if you ever plan on playing it again. No joke, The Sims is solid. Oh, it’s easy if you want to make a ridiculous failure of a Sim who ends up dying in a suspicious fire caused by countless barbecues in a doorless house, but if you want to create a talented, intelligent Sim who lives a fulfilling, successful life full of happiness and joy…well, good luck (and try not to take the heartbreak too badly). What’s the hardest game you’ve ever played? Share it with us in the comments. And if a game is making your life a living hell, why not sell it with musicMagpie? Not only will you get cash, but you’ll save yourself a lot of stress too. Just click below to get started.